Christ is coming very soon, to marry His Bride (the so called 'wise-virgins', see Matt. 25:1-13) - in the spirit - to save her for the great oppression that will come over the whole world. This ‘rescue’ concerns only His wife (see Rev. 12:6 and 14). But... are we - spiritually seen - ready for His coming as our Bridegroom? Luke 22 verse 1-2: "Now the feast of unleavened bread drew nigh, which is called the Passover. And the chief priests and scribes sought how they might kill him, for they feared the people." The Passover feast was near. And it was predestined that Jesus should give His life at this feast for a world lost in sin and guilt. For, this feast was established by God (see Exodus 12:1-28), and pointed to the Sacrifice of Jesus Who, as the Lamb of God, would (voluntarily) give His life to reconcile God with man. The forces of darkness – which then were mainly active in and through the priests and scribes (the religious leaders of the Jews in those days) – tried to capture and kill Jesus in a crafty way. Reason for this was that these chief priests and scribes feared the people, because they people (still) followed Him, because they saw in Him their political Messiah. They did not see Jesus as the Savior of their souls, but mainly as a political leader, and thus as the one who would rescue and deliver them from the Romans' rule. As we know the high priest of Israel was not allowed to enter the Holy of holies of the Israeli Tabernacle without blood (of a sacrificed animal), and without his censer, wherein the prescribed (by God) incense burned. This also was only allowed once a year, namely on the Day of Atonement (Leviticus 16). Having arrived in the Holy of holies the high priest had to sprinkle the blood of the sin offering (i.e. the atoning sacrifice for the sins of the Israelites) seven times; first on the mercy seat of the Ark of the Covenant, and then seven times in front of it. These sprinklings symbolized the seven introductory steps of Jesus, which led to His sacrifice on the cross; as well as the seven actual steps which led Him to His death (on the cross). Luke 22 verse 3-6: "Then entered satan into Judas surnamed Iscariot, being of the number of the twelve (disciples). And he went his way, and communed with the chief priests and captains, how he might betray him unto them. And they were glad, and covenanted to give him money. And he promised, and sought opportunity to betray him unto them in the absence of the multitude." Satan could, of the twelve disciples, use the disloyal Judas (as an instrument) to capture Jesus without rebellion. Perhaps Judas never had a (truly) repentant heart; or perhaps he gradually became entangled in the nets of the (idolatrous) mammon; for he managed the money and therefore was responsible for the finances of this core of Jesus' disciples. However sad, it is unfortunately a fact that he betrayed His Master for money – namely for thirty silver pennies, the price for a slave. And he promised the chief priests, etc. that he would seek a "good" opportunity to have Jesus captured without rebellion, without the common folk noticing anything. Let us (be willing) to learn a lesson from this, that we being warned against the crafty temptations of satan, who tries to capture us too in the nets of the mammon, are delivered from the (often strong) desire for earthly goods and riches. Let us (be willing) to see the danger of idolatrous effects, possibly formed by material things (such as money and goods) and/or people (such as husband, wife and/or children). Let us realize that they may create a separation between us and our Savior-God. For, as is also written in 1 Timothy 6:10, hunger for money is the root of all evil. And this is, because in this world everything (and almost everybody) is for sale for money. The Passover: God's only way to salvation, which, in the Father's heart, was already established at the foundation of this world. Luke 22 verse 7-13: "Then came the day of unleavened bread, when the Passover must be killed. And he sent Peter and John, saying, Go and prepare us the Passover (meal) that we may eat. And they said unto him, Where wilt thou that we prepare (it); And he said unto them, Behold, when ye are entered into the city, there shall a man meet you, bearing a pitcher of water; follow him into the house where he entereth in. And ye shall say unto the good man of the house, The Master saith unto thee, Where is the guest chamber, where I shall eat the Passover (meal) with my disciples? And he shall shew you a large upper room (room on the top floor) furnished: There make (it) ready. And they went, and found as he had said unto them: and they made ready the Passover (meal)." Here are a few more symbols we may take to heart. The question was put where Jesus wished to eat the Passover (meal). The Lord linked up the finding of this place to some marks, which were prophesied in advance: At entering Jerusalem they would find a man, bearing a pitcher of water. A pitcher filled with water is the symbol of our repentant life, a life now (completely) devoted to God. The Passover (meal) therefore was to be celebrated in a heart and life which has turned (sincerely) to God. And, here is a man bearing a pitcher with water. In those days this did not occur often. Usually it was a woman carrying that. The master (good man) of the house would show them a large, furnished upper room. This large, furnished upper room is the symbol of the heart which is (completely) devoted to God. Thus: we are to eat the Passover (meal), now Communion, with a heart that is turned to, and devoted to, God. We must keep our heart (with all diligence) from everything that is not good (Proverbs 4:23 ); we must keep our heart for Jesus and His gracious works. Luke 22 verse 14-18: "And when the hour was come, he sat down, and the twelve apostles with him. And he said unto them, With desire I have desired to eat this Passover (meal) with you before I suffer: For I say unto you, I will not any more eat thereof, until it be fulfilled in the kingdom of God. And he took the cup, and gave thanks, and said, Take this, and divide it among yourselves: For I say unto you, I will not drink of the fruit of the vine, until the kingdom of God shall come." Jesus would eat the Passover lamb for the last time in the way, established by God in the Old Testament, and drink wine therewith, as is still customary today; for soon Jesus Himself, in and by His sacrifice on the cross of Calvary, would form the great Anti-type, whereby is meant the spiritual reality, whereof all others form a shadow. "Purge out therefore the old leaven (= symbol for sin), that ye may be a new lump, as ye are unleavened. 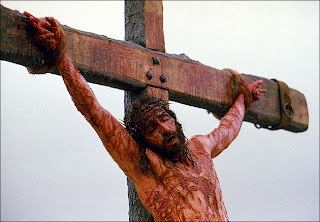 For even Christ our Passover is sacrificed for us" (1 Corinthians 5:7). The Kingdom of God would, by His resurrection, ascension (to heaven) and by the (Pentecostal) power of the Holy Spirit, break through (begin) in the hearts of those children of men who (truly) turned to Him. In and by the Holy Spirit, this Passover will bring us in close union with His death and resurrection; make us "one planting" with them (Romans 6:5); whereby NEW and divine LIFE can be poured out into the hearts and lives of all He, by His sacrifice, was able to grant grace (Revelation 3:20b). These works of grace He put as a divine promise in the sacrament (means of grace) He was about to establish, namely the sacrament of the Communion; a promise He would confirm by the shedding of His own blood. Luke 22 verse 19-20: "And he took bread, and gave thanks, and brake it, and gave unto them, saying, This is my body which is given for you: this do in remembrance of me. Likewise also the cup after supper, saying, This cup is the new testament (covenant) in my blood, which is shed for you." It is a renewal of the divine blood covenant God made with Abram (as mentioned in Genesis 15), and the (divine) works of grace of which at the end of this period of grace (i.e. in the end-time) will be so miraculous, that God will be able to realize and fulfill His great mystery – of which Revelation 10:7 speaks, and whereby is meant the revelation of His Bride(church). Then He will be able to celebrate the Supper of the Marriage of the Lamb (Revelation 19:9). This Supper precedes, and is a preparation unto, the Wedding. This is to prepare the Bride as a (divine) channel, as a (divine) instrument in His hand to gather in the last, great harvest of souls. After this harvest of souls (see Revelation 14:14 -16) and after the Millennium the eternal Marriage of the Lamb will take place (Revelation 21:1-27). God then will have created a Bride for Jesus, the heavenly Bridegroom, that the eternal divine marriage feast be celebrated. Luke 22 verse 21-23: "But, behold, the hand of him that betrayeth me is with me on the table. And truly the Son of man goeth, as it was determined: but woe unto that man by whom he is betrayed! And they began to enquire among themselves, which of them it was that should do this thing." Luke brings this revelation of Jesus after the establishment of the (New Testament) Communion. The other gospel writers, namely Matthew, Mark and John, place this revelation of Jesus after the eating of the (Old Testament) Passover lamb, but before the establishment of the (N.T.) Communion. The fact that someone shares the O.T. Passover or the N.T. Communion unworthily tells us, that not everybody who eats the Communion bread and drinks the wine, shares the Kingdom of God in truth. But everybody has to examine himself scrupulously, as we can read in 1 Corinthians 11:28-29: "But (first) let a man examine himself, and so let him eat of that bread, and drink of that cup. For he that eateth and drinketh unworthily, eateth and drinketh damnation to himself, not discerning the Lord's body". But this Word also tells us that there might be traitors among those that share the Communion, especially "at the last hour", when people will be possessed by satan, because of which they (a.o.) will suffer from an increasing persecution mania (Revelation 9:1-12)! CLICK HERE if you want to read this study (Chapter 22) – that is to long for the Blog.